Unabashedly, Maruti Suzuki DZire has been the country’s best-selling sedan ever since its launch around five years back in 2012. It has been clocking sales in excess of 12000 units on an average basis per month, which is way more than the combined sales of all its competitors. However, with time, the sedan started losing its charm and shine, while the sales also witnessed a gradual dip. 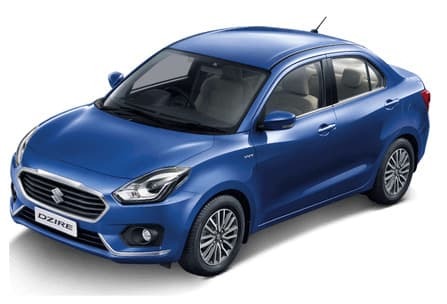 Henceforth, in order to retain the good old days and reclaim the glory, Maruti Suzuki has brought the all-new DZire sedan with fresh styling, updated cabin and increased mileage. The sedan is offered in both petrol and diesel fuel trims in four trim levels: LXi/LDi, VXi/VDi, ZXi/ZDi and ZXi+/ZDi+. Underpinning the lightweight ‘HEARTEC’ architecture, borrowed from the Baleno hatch, it is available with AMT gearbox with V grade onwards in both petrol and diesel fuel trims. The new car comes packed with a plethora of advanced features, while paramount importance is given to safety with ABS, EBD, BA and dual airbags as standard across the entire variant range. The Maruti Swift DZire 2018 is based on all-new platform, which Suzuki calls as Heartect. Earlier, this platform has been seen on the Maruti Baleno. This new platform uses high strength steel, making it stronger and even more lighter. As the Maruti DZire 2018 is wider, it results n better handling. The Maruti Dzire 2018 now looks very stylish from the front. It is a pleasing design and does not seem like its trying too hard to look good. The new Dzire looks balanced and contemporary as well. The fascia receives a new imposing grille that has a chrome surround, which looks like a lip. The third generation Maruti Dzire gets a good equipment list. You get automatic climate control and the cooling performance from the AC is very good and the rear AC vents are a big plus. The ORVMs are electrically adjustable and folding. The audio system is the same one that is also offered on the Baleno. The 7-inch touchscreen has a good response and it gets Apple CarPlay and Android Auto too. Connectivity is seamless and the sound quality from the speakers is very good. Apart from that, the Dzire also gets keyless go with push button start and unlock sensors on the door. All-new Maruti DZire is available in both petrol and diesel fuel trims with the same set of petrol and diesel engines. The petrol variants are powered by a 1.2L 4-cylinder K-Series engine which generates maximum power output of 82bhp at 6000rpm and peak torque performance of 113Nm at 4200rpm. On the diesel front, the company’s tried-and-trusted 1.3L 4-cylinder DDiS 190 engine is at the helm of affairs. It belts out top power of 74bhp at 4000rpm and highest torque of 190Nm at 2000rpm. Both the engines are linked to a 5-speed manual transmission as standard, while the 5-speed AMT gearbox is also on offer from V trim. All-New Maruti DZire is more fuel efficient than the preceding model due to the use of ‘HEARTEC’ platform as it makes the sedan lighter by 70-80 kgs than before. The petrol variants deliver a mileage of 22kmpl with both manual and AMT variants, while the diesel variants return 28.40kmpl in both manual and AMT models. Both the mileage figures are ARAI Specified. The suspension gets a softer setup and hence the ride feels much better than the previous generation Maruti Dzire. The body control has also improved and the car feels composed even over bad patches. Talking about steering feel, the diesel variant gets a heavier steering and has decent feel while the petrol variant gets a lighter steering which lacks feel. Just like other newer Maruti cars, the steering doesn’t self-centre and feels dead at times. Handling is good and the Dzire is fun to drive. The ground clearance isn’t the best but the vehicle didn’t really scrape anywhere. Braking performance has improved and the stopping power is really good.